"Rachel is an expert knitter, using locally dyed and selected yarns. 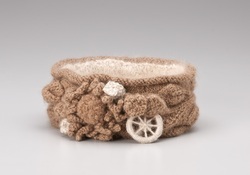 She has designed a gorgeous headband with angora lining and wonderful cable gloves for me. Her work is displayed in The Collective in Woodstock and her juried work has admitted her into the League of New Hampshire Craftsmen."